You’ll be more than pleased when you see just how many requirements these cookies meet. They’re gluten free, fructose friendly, low fodmap, lactose free, dairy free, egg free, vegan, paleo (I think), refined sugar free and guilt free! Yep they’re pretty special cookies, and anything but delicious free. Instead of using eggs as I’d usually do when baking, I decided to go with a winning alternative on this occasion. The flax-egg. Flax or chia “eggs” are made with 1 part ground flax or chia seeds to 3 parts water. It amazes me every time when within minutes, this simple concoction turns to a gooey egg-like gel. So versatile. So easy. And it’s perfect for raw, vegan and egg-allergy baking. Not to mention, those situations when you are half way through baking and you realise there are no eggs, and you sigh, as you know you were the one who ate that last egg for lunch only moments prior. That one egg that would’ve meant plates full of tasty joy. Yes, we’ve all been in that situation before. So now it’s good to know I have options. Now that we have the egg situation sorted. I’ll move on to the flavour combo that I know you’re drooling over. Chocolate. Salt. Caramel. Drool. The dark chocolate flavour of the raw cacao is so indulgent, and the chewy bits of dates and hint of maple sweetness, provides a tasty caramel flavour. These little treats will make you think you’re being naughty – but you’re not! Eat as many as you want. And hey did I mention, in case 12 minutes is just too long to wait, these cookies can most definitely be eaten raw. Preheat oven to 180°C and line a tray with baking paper. Combine almond meal, cacao powder and salt in a mixing bowl. Melt coconut oil in a separate bowl, and mix together with dates, maple syrup, vanilla and flax egg. Stir the wet ingredients into the dry to form a dough. Bake for 12 minutes. 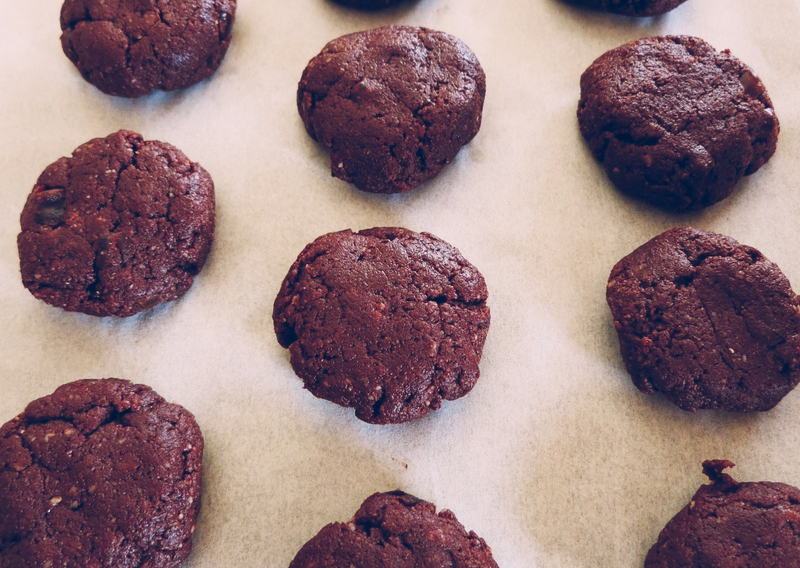 Allow cookies to cool and store those you don’t immediately devour in an airtight container. Hey great site and recipes. Can't wait to try them all and can't believe I haven't discovered your site earlier. Just wondering, as with most things, intolerance levels are individual and unique. I noticed you use a lot of things I wouldn't dare touch due to my strict low fodmap diet adherence. Have you found that you and most other fodmappers are ok with the recipes? For example the dates, LSA, almond meal, spelt flour, etc. ?